Charlemagne (Latin: Carolus Magnus, English: Charles the Great, German: Karl der Große, Dutch: Karel de Grote) (c.742 – 28 January, 814) was the king of the Franks and the first emperor of the Holy Roman Empire. He was crowned as the Emperor on Christmas Day, 800. He was the older son of King Pippin III of the Carolingian dynasty. When Pippin died, Charlemagne and his brother Carloman ruled together. When Carloman died in 771 Charlemagne became the only ruler of the Franks. The Franks—one of the Germanic peoples who had moved their homes over the River Rhine into the Roman Empire as it was falling apart—were, by the year 700, the rulers of Gaul, and a lot of Germania east of the Rhine. They also protected the Papacy and the Roman Catholic faith. 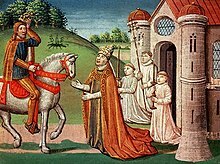 When their king Pepin the Short died, his sons, Charlemagne and Carloman were chosen to share the kingdom. They divided it into two parts: one half for Charlemagne, and the other for Carloman. Carloman died on December 4, 771, leaving Charlemagne as the leader of the whole Frankish kingdom. He was king of the Franks from 768, and king of the Lombards from 774. He was crowned Imperator Augustus (Emperor) in Rome on Christmas Day by Pope Leo III in 800, starting the Holy Roman Empire, that they hoped would be a kind of second Western Roman Empire (while the Byzantines in Constantinople were still keeping up the Eastern Roman empire). With many wars, Charlemagne spread his empire across much of Western Europe. Charlemagne fought in many wars over the course of his reign. He is known for using his sword, “Joyeuse”, in each of the thirty years of war and the 18 battles he fought in. He also finally managed to conquer Saxony, something the Roman Emperor Augustus could not do 800 years earlier. He was able to convert the Saxons to Catholic Christianity. He also had many schools built so his people could learn. However, he also killed thousands of those who failed to convert. Charlemagne's politics and plans failed, which led to low self-esteem. His last years were spent in bed in deep depression. He died in 814, leaving his kingdom to his only son, Louis the Pious. The descendants of Charlemagne are called Carolingians. His family line died out in Germany in 911 and in France in 987. Wikimedia Commons has media related to Charlemagne. This page was last changed on 2 April 2019, at 07:52.